Legend of the Five Rings Oriental Adventures Secrets of the Mantis RPG Book is a dual-system supplement for the Legend of the Five Rings Role-Playing Game, Second Edition, and Rokugan, the d20 Companion for Legend of the Five Rings. Players and DMs may also find it useful as a source of interesting new feats and abilities for any d20 System campaign. Game Masters running the Second Edition L5R RPG will need a copy of the Legend of the Five Rings Game Master's Guide and the Player's Guide. Players need only the Player's Guide. Dungeon Masters running d20 System games will need a copy of the Player's Handbook, the Dungeon Master's Guide, Oriental Adventures, and Rokugan. Players will need only a Player's Handbook. 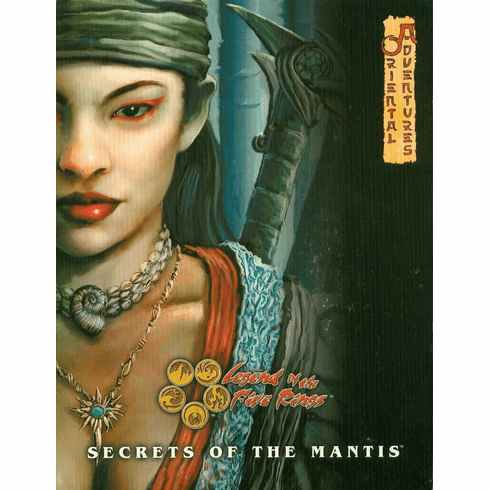 Secrets of the Mantis is an incredible sourcebook containing a treasure trove of information specific to Mantis Clan campaigns. Provinces, customs, history, and important individuals are explored with depth not available in past books. This book not only serves as a player's guide to being a Mantis but equally as a GM's guide for creating adventures set in Mantis territories. Includes a special Secrets chapter containing unrivaled mysteries of the Mantis. This book also updates the story through the current expansion of the CCG arc. Compatible with the traditional Alderac game system and the popular d20 system. New options for campaigns and character creation mean that product will appeal to both players and GMs. Setting information is adaptable to other settings with little difficulty which appeals to non-L5R d20 fans. Contains new fiction and great background information featuring L5R characters. Strong inherent continuity with the L5R CCG. Secrets of the Mantis explores the youngest Great Clan from within, illustrating their customs, holdings, and way of life. But beware: the lands of the Mantis are quite hazardous, and who digs too deeply may not return from the isles. Within you will find: Insight into the culture of the Mantis Clan and the families that comprise it. Background on the allies of the Mantis- the Badger and Tortoise Clans. Mechanics for lesser-known groups within the clan, including the Tsuruchi Kenkyaku and the secret spells of the Moshi family. An examination of Still Water Cove, the hidden lair of the nefarious Kolat Master Moshi Shanegon.